with a sometimes disappointing performance? Aren't they supposed to be reliable winners? But what are the real reasons why people invest in blue chips? Are they sensible reasons? Here are some of the real truths about blue chip shares. Please read on . 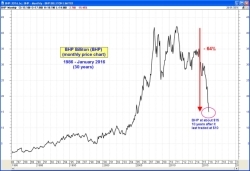 . .
What does blue chip really mean? "Larger companies with a long history of profitability and stability." The ASX revises this definition from time to time (this version is different to the one that was posted on the web in 2008). But what does this really mean? Let's take a look at the definition in detail. "Larger companies..." - Okay, so blue chip companies are larger. But larger than what? We could look at the definitions for "large cap" companies versus "medium cap" or "small cap" companies, but there is no standard definition for this. There isn't a list of "larger" companies. So this is a very subjective description. If we prepared a list of all companies, and sorted it by market cap, where would we draw the line to distinguish large caps from medium caps? "...long history..." - The blue chip companies have a long history. Well, how long is "long" - is it just a few years? or ten years? or longer? "...profitability..." - So, how do we define profitability? Is this the amount of profit after tax? Or perhaps profit before tax (EBIT)? What about the Return on Funds? ROE (return on equity)? or ROSF (return on shareholder funds)? Or what? And to what degree are they profitable? If we look at ROE, for instance, do we want to see a 10 percent Return on Equity over just three years? or maybe over 5 years? or 10 years? "...stability..." - How on earth do we define stability? So, we can see that this definition of blue chip is very vague, and it doesn't really tell us anything substantive about a company that is labelled as a blue chip. We are told that it is good to have blue chip companies in our portfolios. Lots of people talk about blue chip companies. Lots of investors have so-called blue chip companies in their portfolios. Our broker or financial advisor might recommend that we include blue chip stocks in our investment portfolio. So, how do we find out which stocks are blue chip? Try this - Ask your broker or adviser for a list of blue chip stocks. They probably won't provide one - because there isn't one. If they do give you one, ask them what qualifies a company to appear on their list. And if they do give you a list, it might be similar to a list from another source, but it probably won't be identical. How did the term blue chip come about? Well, many years ago, the blue coloured chip in the casino was the most highly valued chip of all. And so this label was applied to companies that were considered to be highly valued. Blue chip stocks can be disappointing! Would it surprise you to hear that blue chip stocks can be disappointing? Their share price performance is not guaranteed. If you want to see capital improvement, there are times when you might be waiting quite awhile. It only takes a common old bear market, or a severe market correction, to highlight how poorly many blue chip stocks perform over the medium term. If you invest for the very long term, then that might be a different story. But for short-term capital profits we want to see shares increase in value over several months, or at most a couple of years. During the infamous Global Financial Crisis (GFC - aka Global Credit Crunch) of 2008, many blue chip stocks fell in value, and by mid-2011 (when this web page was first posted) some 3 years later many of these blue chip stocks were still well below their market peaks of 2007-2008. For anyone who is trying to simply ride out this period of poor market performance, they could have been waiting a long time. 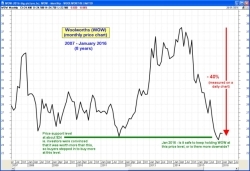 Then there was the end of the resources boom which hit very hard in 2015, and resulted in a commodities downturn, and many mining and resources stocks suffering sharp price declines. See the material below for details. beware of the sharks in the ocean! class="ht14"
Who would have thought that Australia's goliath stock BHP Billiton could have suffered the share price decline that it experienced in 2015. Could we have anticipated this? Well, perhaps we might not have forecast that this cold happen; but the technical analysts amongst us could have seen a down trend developing, and protected our capital by closing the position before it got drastic (perhaps by using the Stop Loss approach). See the next price chart below for more details. 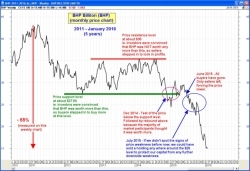 We could have used key information in the price chart of BHP Billiton to protect our precious investment capital from the sharp share price slide from 2012 onwards. The price chart at right includes some text to explain the concepts of how we could use the price chart features to do this (Toolbox Members click for a larger version). more details about more blue chip stocks. Members introduction here . . .
Consumer Staple stocks are safe - aren't they? Now, it's supposed to be a good idea to buy Consumer Staples stocks because of their resilience in good times and bad. 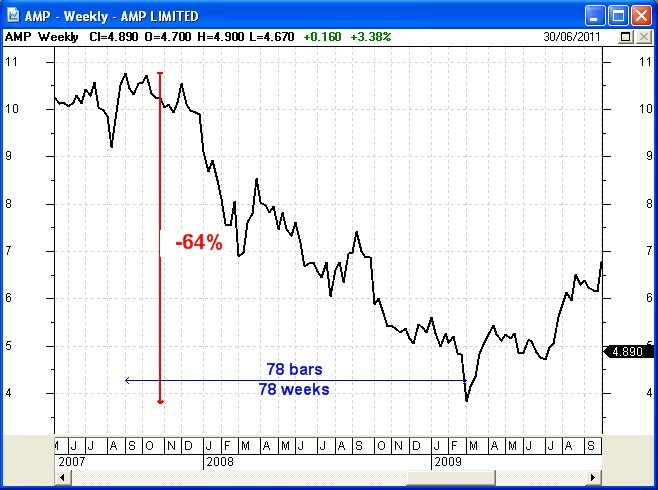 However, the price chart of Woolworths (WOW) at right tells us otherwise. The details below talk about the blue chip stocks that fell during the GFC. And the stocks in the right-hand column are good examples of what can happen to blue chip stocks at any time, not only during a GFC. at least 30 more stocks in detail. 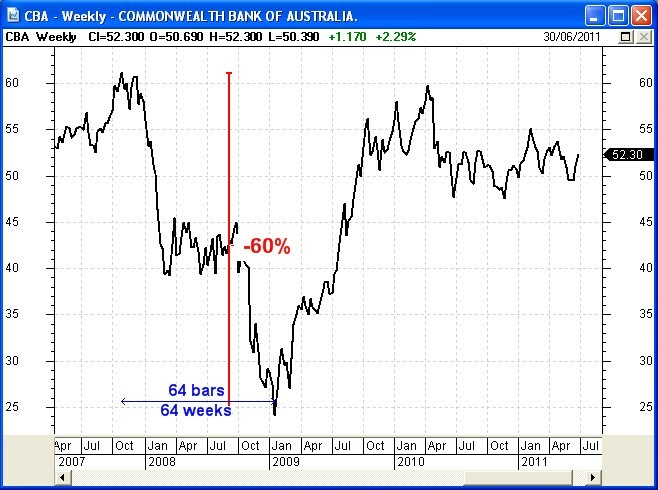 A number of Australia's blue chip stocks fell more than 50% during the Global Financial Crisis (GFC) of 2008-2010+. And at the time of writing this material (July 2011), these blue chip stocks were still under their highs of almost 3 years earlier. Actually there are quite a few blue chip stocks that fall into this category, not just the two samples here. 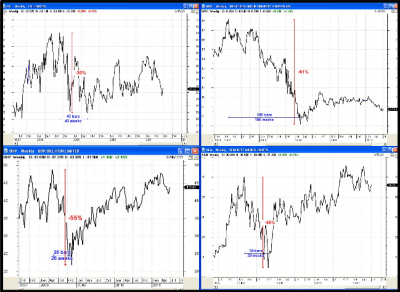 The collage of four stocks at right are just four more examples of falling blue chips. These four fell between 30% and 60% over periods between 26 and 106 weeks. 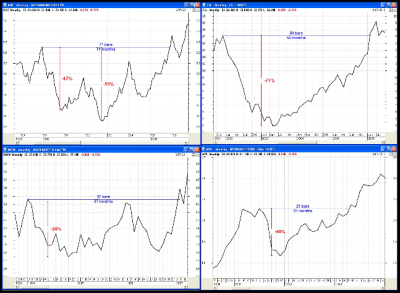 At the time of writing here, a couple of these are still well down, and a couple are close to recovering to their past highs (after about 3 years!). Which stocks are these four? NOTE: For the purpose of studying "blue chip" stocks here, we are looking primarily at the Top 50 Australian stocks - the XFL index (S&P/ASX 50). Also, there are probably a few more stocks that fall into this category, and which are not listed here. See more in the Toolbox Member area. Four more falling blue chips. Over the last 25 years or so a number of Australia's blue chip stocks fell more by a large amount, and did not regain their old highs for many months, or even for years!! 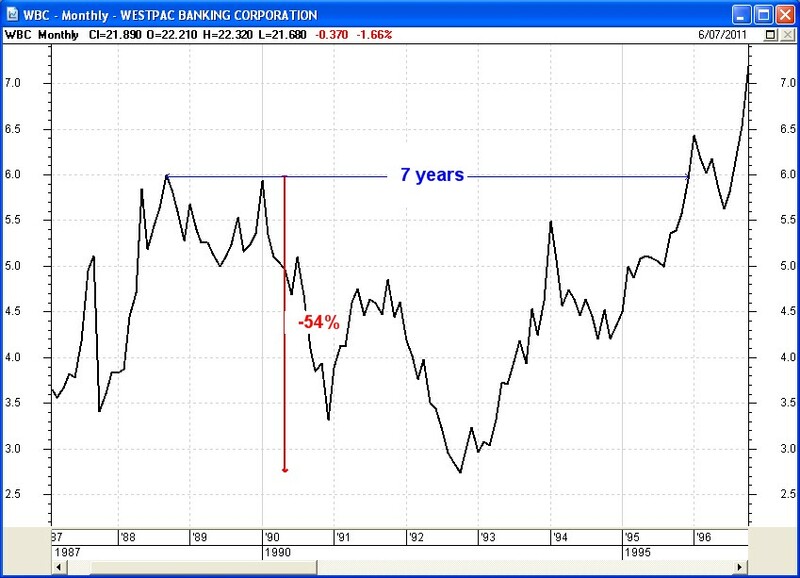 Westpac bank (WBC) fell 54% over a 4 year period, and took a total of 7 years before it made new highs and stumbled again the following year. 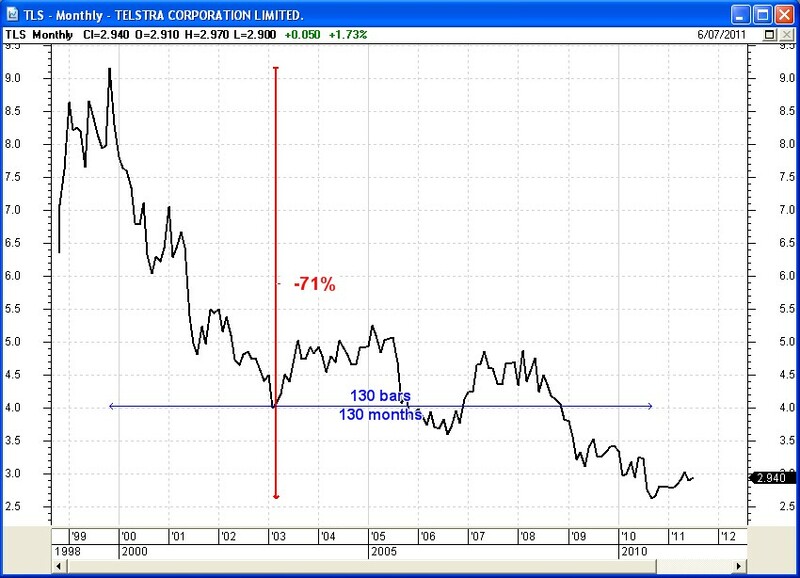 Telstra (TLS) is that one stock that has fallen 71% over 11+ years, and is still not looking like making new highs anytime in the near future. Anyone who invested in the initial T1 float has seen their capital destroyed. Likewise in both T2 and T3, even after the government and some advisers and brokers recommended investor partipication. The collage view of four stocks at right shows just four more blue chip stocks that fell a long way, and which took a long time to attain new highs. at least 10 more stocks in detail. Four more fallen blue chips that took a while to recover. Don't forget that the opinions of the market participants are summarised in the price charts. 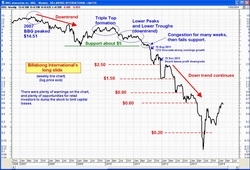 If enough participants have a particular view about the stock, then it is reflected in the price chart (it pays to understand the stories in the price charts). Blue chip stocks might not be all they are cracked up to be. Blue chip stocks might give us reasonable dividends over time, but their capital improvement value might be impaired. Perhaps we could sell our blue chips at an opportune time to capture our profits, and then buy back later. It pays to understand the stories in the price charts (technical analysis). © Copyright 2011-2017, R.B.Brain - Consulting (ABN: 52 791 744 975).